We know the Easter Bunny is full of sweet and delicious treats. However, this is another holiday that you can celebrate just as joyously without wrecking your diet and falling off of your fitness journey. Challenge yourself and our family to have a healthier Easter this year! We've given you some fun ideas, both edible and non-edible, to help you create a healthy Easter basket this year! Annie's Homegrown brand has multiple products that are bunny shaped and fun for both kids and adults. Chocolate covered strawberries (or any other fruit!) are always a delicious and juicy treat. Don't feel the need to go cold-turkey and have no candy at all - that's no fun! Try making your own, homemade peanut butter eggs or buying individually wrapped treats, like dark chocolate. If they're individually wrapped, you're less likely to over indulge and you won't be eating handfuls (Hello M&Ms!). You're probably laughing at us for suggesting carrots. But, after all, they do play a part in the commercialized theme of Easter. We know carrots aren't as fun as chocolates. But, throw in a new flavor of hummus to try and you'll have a new healthy snack. Some non-edible ideas are lip-balm, make-up or toiletries, gift-cards, side-walk chalk (undeniably fun for both kids and adults! ), small fitness equipment like a jumprope, and stationery. We all enjoy receiving a hand-written note these days and writing friends can actually help reduce stress. We hope this helps you think healthy this Easter! Happy Easter! 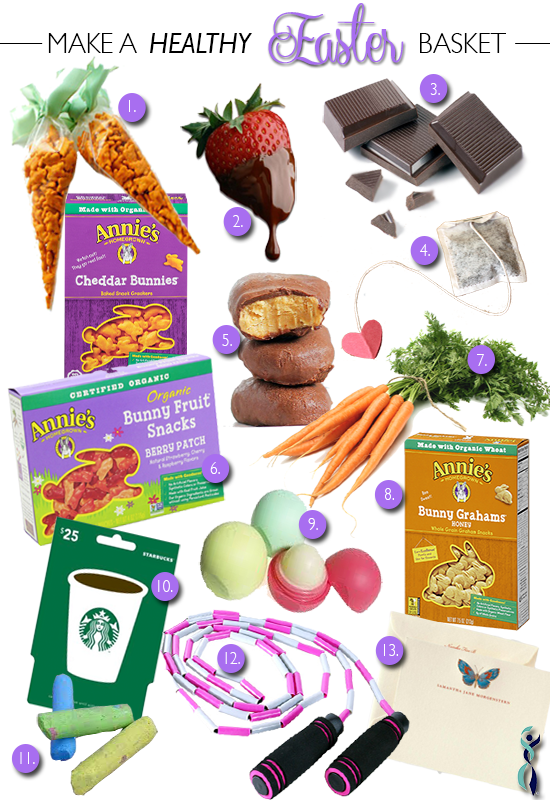 Do you have any other tips for making a healthy Easter basket? Share with us in the comments below!